The 3 day Classic Fly-in Moremi Vistas Package takes you on a tour of Botswana's world renowned Moremi Game Reserve, right in the heart of the Okavango Delta. 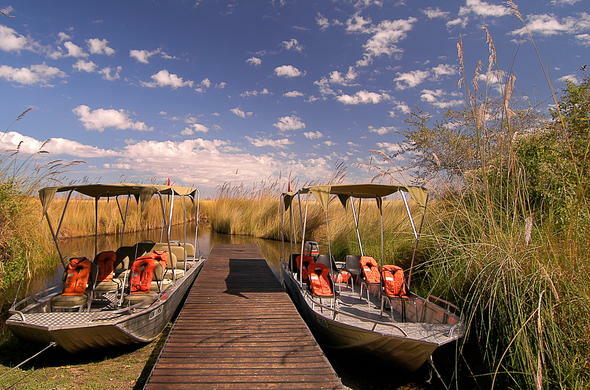 This Botswana package tour includes flights ex/to Johannesburg, and has no set departure dates. Seasonal: All year round, best time during the dry season from April - October. This package does not run during the main rainy season from Mid February to Mid March. Our 3 day Classic Fly-in Moremi Vistas package takes you through the Moremi Game Reserve, which is considered by many to be the most beautiful game reserve in Africa. It is one of the last sanctuaries for African Wild Dogs and is renowned for the large herds of Elephants that are resident year round. 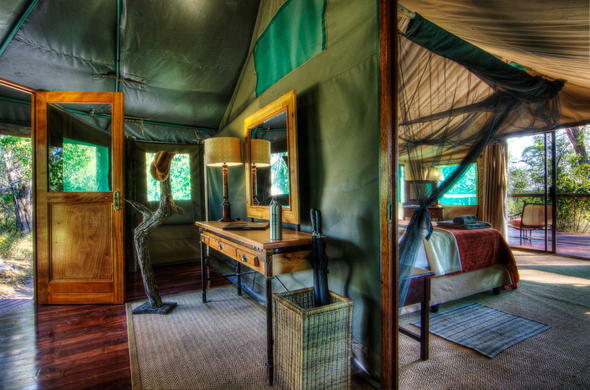 You will be staying in a classic colonial style safari camp that overlooks the beautiful Xakanaxa Lagoon. 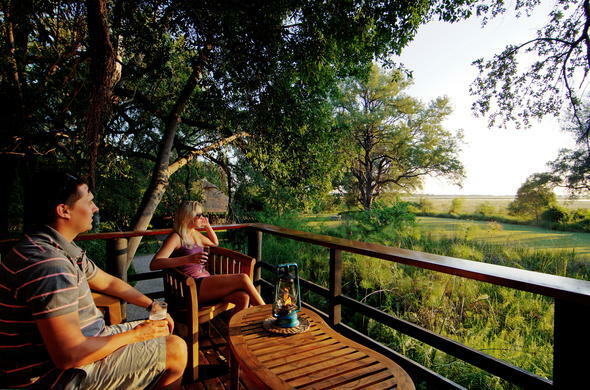 The Moremi Game Reserve has contrasting habitats, juxtaposing dry Kalahari Desert habitats with a wetland paradise. On the floodplains around the edge of the Delta, you will have the chance to see Lechwe and Tsessebe as well as Wildebeest, and in the drier areas you'll see animals including Cheetah and Bat Eared Foxes. On your Moremi safari you can enjoy tracking big game during morning and afternoon game drives. These are conducted in open 4x4 vehicles, and are led by expert and knowledgeable guides. Guided bush walks offer excellent opportunities for bird watching while exploring the Xakanaxa Lagoon and surrounding Okavango channels by motorboat. You can also explore the Delta channels in a traditional-style boat called a Makoro. On the first day of your Botswana tour you will fly from Johannesburg to Maun. At Maun you will catch a flight in a light aircraft into the Okavango Delta. Once you have settled in to the bush camp, you can set off on your first afternoon safari activity, which could be an afternoon game drive or a motorboat game viewing trip. You'll receive an early morning wake-up call, before heading out to explore the intricate channels of the Okavango in a traditional canoe called a makoro, or by motorboat. Alternatively you can set out on a guided nature walk which provides the opportunity to track some of the wildlife that lives in this water wilderness. You'll return to camp to enjoy a delicious brunch. In the middle of the day you can relax in your tent or enjoy a refreshing dip in the pool. In the late afternoon you could go fishing for Tilapia and Tiger fish, or set out on a guided game drive. You'll stop off in the bush at a scenic spot for sundowners, before returning to camp and enjoying a delicious dinner. In the morning you will enjoy one final early morning game viewing activity followed by breakfast before flying to Maun. There you will catch your connecting flight back to Johannesburg. This 3 day fly-in Moremi Vistas package includes scheduled flights ex/to Johannesburg, the light aircraft transfers to and from the Moremi Game Reserve in the Okavango Delta, and accommodation for 2 guests sharing an en-suite room. 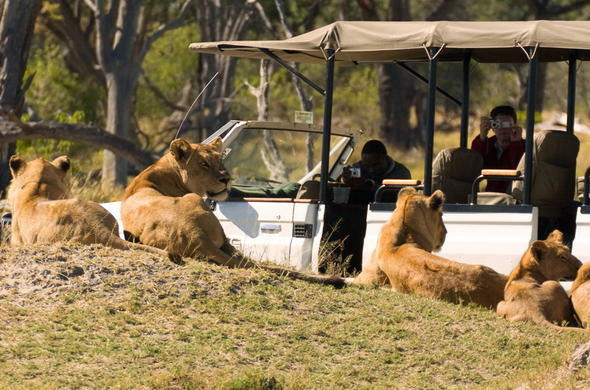 This African safari package is all inclusive of meals and scheduled activities. This Okavango package can be also combined with a stay at the Chobe National Park and Savute region.